A mountain bike without suspension or disc brakes? The BeOne Karma might well be the right option for mtb-curious road riders. You may have noticed in recent months we’ve been featuring more mountain bikes in the pages of Cycling Active. Although most of us come from road cycling backgrounds, we’re not averse to hopping aboard a chunky-tyred titan and rolling around in the mud, away from the frustrations and dangers of motorised traffic. Indeed — whisper it quietly — the more we think about it, the more mountain biking appeals. For any roadie looking to take his or her tentative first steps in the bumpy world of mtbs, this BeOne Karma could be a sensible, not too foreign option. 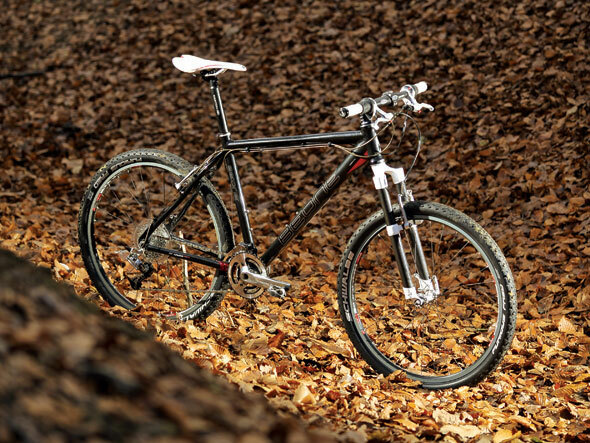 Rather uniquely for a modern mountain bike, there is no suspension, either front or rear; a set of rigid carbon forks are fitted at the head tube; there is no sign of disc brakes, with v-brakes handling stopping duties instead; and even the sport-orientated Prologo saddle has a road bike appeal to it. But this is very definitely an off-road machine. First there is a set of chunky rubber tyres from Schwalbe, amusingly titled Furious Freds. Then there is the light alloy frame, with strengthening gussets at all the important points. The drivetrain is wide-ranging mountain bike-specific and features a mixture of SRAM’s X9 and X7 series, with X9 gripshifters controlling gear selection. And finally there is a range of Easton finishing kit. All this makes a very attractive and extremely light package. At 9.9kg without pedals, this machine is lighter than some road bikes I’ve tested recently. So how does it ride? First, let me make a confession: I haven’t ridden a mountain bike in 17 years. But after years of using STI shifters on drop-bar bikes I was intrigued to get my gloved paws on those SRAM X9 gripshifters, and they are incredibly effective. Only a moderate amount of force is required to slip from one speed to the next, and each gear change is smooth and definite — there’s no floundering or waiting for something to engage. Indeed the whole ride is a supremely positive affair. I used the Karma for one of our Readers’ Rides around Rutland Water, so it was only subjected to a very docile off-road challenge, but it handled the task splendidly. It quickly picks up speed when you put the hammer down, and it is easy to keep the Karma in complete control when you hit rough stuff. Of course there is that lack of suspension, which means you are often hopping out of the saddle to allow your legs to soak up the bumps. But when you do get the chance for a sit-down, that racy seat is a fine place to perch. Back in the day I used to have bar-ends fitted to my mountain bike, and I think they would be a welcome addition here. For anybody used to resting their hands on the brake hoods of a road bike, there might be a natural instinct to stretch out a little more. Aside from that, the Karma is perfectly comfortable whatever is passing under tread. So it looks good, it goes well, it’s fun to ride, and it’s comfy — what’s not to like? Well, here’s the rub — in just 25 miles of noodling around Rutland Water I went through a complete set of brake pads, front and rear. The excellent, lightweight DT Swiss rims have a ceramic coating which would rapidly wear through non-ceramic brake blocks, so I can only assume these were fitted to our test bike in error. In any case, it meant that when we got to the last small descent of our tame reservoir loop, I didn’t have enough brakes left to come to an absolute stop (and I was also covered in a fine layer of grey brake dust). To be fair, the v-brakes worked a treat while they lasted. That actually relatively small matter aside (replacement ceramic brake blocks are cheap and easy to fit) the Karma is a great bike. It really is a perfect starting point for the mtb-curious road rider or anybody intending to do some moderate and moderately quick off-roading. Finally, while that retail price might seem a little steep, BeOne’s UK retailer Chain Reaction Cycles is currently selling this bike at a bargain £923.98. Which means you should have a bit of cash left to buy some new brake pads. It’s pretty tricky to find mountain bikes with no front suspension, but this Flash 2 from Cannondale matches the Karma pretty closely, in spirit at least. Based on Cannondale’s carbon Flash performance frame, the F2 is made from 6061 T6 alloy — like the Karma — and is built around a racing geometry. Unlike the Karma, though, Cannondale has opted to spec a Shimano drivetrain. While it doesn’t feature a traditional-looking suspension fork, Cannondale’s HeadShok Fatty does provide dampening. And, also unlike the Karma, there is a full set of Avid disc brakes. But the Flash 2 and Karma do have their eye on the same thing — all-out speed. This article first appeared in the February 2011 issue of Cycling Active magazine.